The updated Villa la Esperanza includes 16 new units of low-income housing plus the 5,000-square-foot Frank Renda Community Room for meetings and after-school sessions of tutoring. Another 16 units of low-income housing were officially celebrated Tuesday, on a glowing morning matched by the good vibe of a deed done well. The new units were created after dividing several five-bedroom apartments at Villa la Esperanza, an existing complex on South Kellogg Avenue in Goleta originally financed by contributions from area churches and built by Michael Towbes in 1971 to house homeless people. Over the past three years, People’s Self-Help Housing and myriad partners have been rebuilding to create 83 rehabilitated apartments. The rents on the units, already completely full, allow the tenants to pay the recommended 30 percent of income on housing. Villa la Esperanza was originally built with a “huge donation from local churches who wanted to address homelessness in Goleta,” said John Fowler, who heads up People’s Self-Help Housing, which currently operates in Santa Barbara, San Luis Obispo, and Ventura counties. “They worked collectively 40 years ago and brought in a local developer they knew and trusted,” he said. “They educated themselves on affordable housing and built and maintained Esperanza all these years.” The housing was given to People’s Self-Help to manage, “and it turned out to be a $22 million gift,” Fowler said. 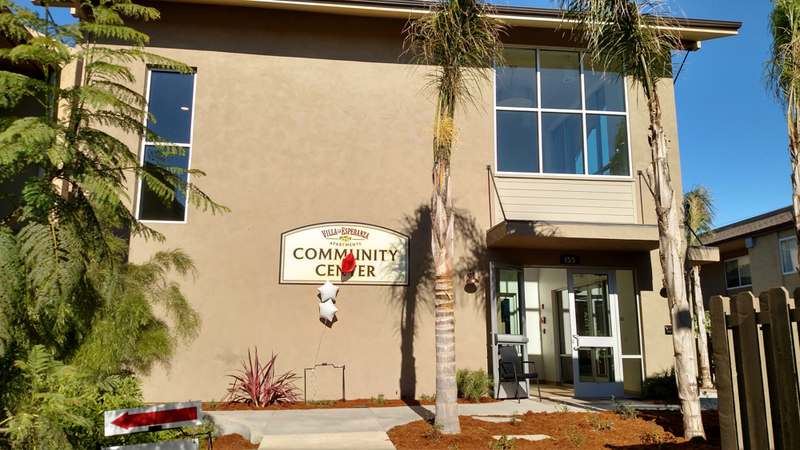 The rehabilitation cost about $20 million — funded through the Goleta Valley Housing Committee, Citi Community Capital, Merritt Community Capital Corporation, and U.S. Housing and Urban Development — but People’s has been able to take the enhanced value of the property and use it to help finance other projects, about 250 units’ worth, Fowler estimated. For Villa la Esperanza, the rehab included installing energy-efficient fixtures that save 10 percent across the property, as well as full accessibility in the new ground-floor apartments. The churches initially involved — Christ Lutheran Church, Goleta Presbyterian Church, Cambridge Drive Community Church (then known as First Baptist of Goleta), Catholic Charities, and University United Methodist — were joined by the Goleta Neighborhood Association in working out the logistics for the building over the years. A retired physicist with S.B. Research, Renda had served on the Neighborhood Association board for more than 30 years, advocating for a quality of life for those who lived at Villa la Esperanza, through learning and the ability to hold celebrations in a larger community space.